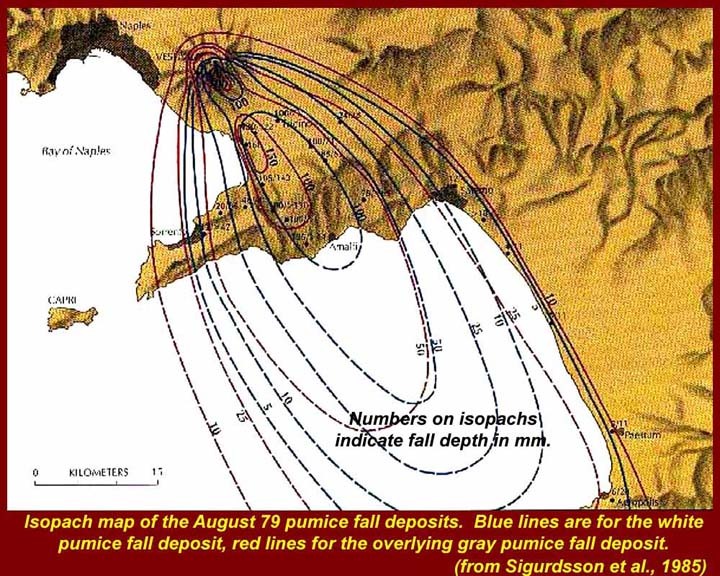 The eruption began at about noon on 24 August of AD 79, its paroxysmal phase lasted until the next day but waning, small-scale activity may have continued for some time (at Pinatubo, in 1991, declining activity continued for more than 2 months). It erupted about four cubic kilometers of magma from a zoned magma chamber in less than 24 hours. Airfall tephra was blown South-Southeast and is traceable up to 74 km away, near Agropoli (at the bottom right of the isopach map on page 4). Several towns and villages were completely annihilated, mainly by burial under thick pumice fall deposits (up to 2.5 m thick in Pompeii) in the SE sector of the volcano, and by much thicker pyroclastic flow deposits (more than 20 m at Herculaneum) on the S and W flanks. At least 3600 people were killed. The number of those displaced or otherwise affected by the effects of the eruption is not known. What did the Volcano look like? Still unknown. A picture in Pompeii shows a single peak. A picture in Herculaneum shows a double peak. 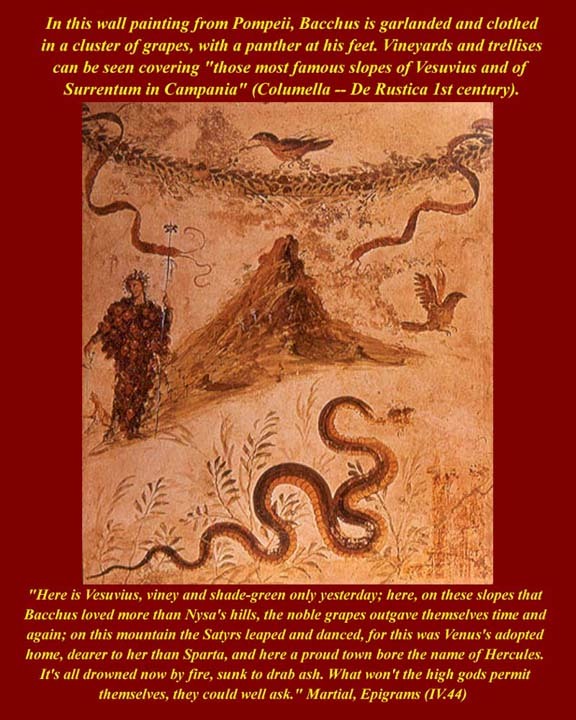 The picture of a single-peaked Vesuvius found in Pompeii. The Standing figure is Bacchus, clothed in grapes -- Vesuvian wine was considered the best available. Above the mountain is a grape garland with two descending ribbons. The snake in the foreground is a symbol of good fortune. Pompeii was commercial and middle class, but also somewhat touristy. Rich Romans (including the Emperor and the Aristocracy) had villas around the Bay of Naples and in the surrounding hills. A naval base and commercial port facilities were at the northern end of the bay. The hinterland was used for agriculture: grapes, olives, truck farming. Big rich villas usually had a farm component, but there were also many small farmers. Local seismicity for several months leading up to the AD 79 eruption. Ground uplift probable, but not documented. Initial phreatomagmatic activity -- morning of August 24. : violent explosions (not mentioned by Pliny) deposited a few centimeters of ash east of the volcano. The east side may have blown out near the top and there may have been a small pyroclastic flow (surge). Probably alarmed nearby residents, but no evidence of any exodus of population. Plinian phase and pumice fall -- started about noon on August 24. Pliny became aware of it about 1 hour into the process. 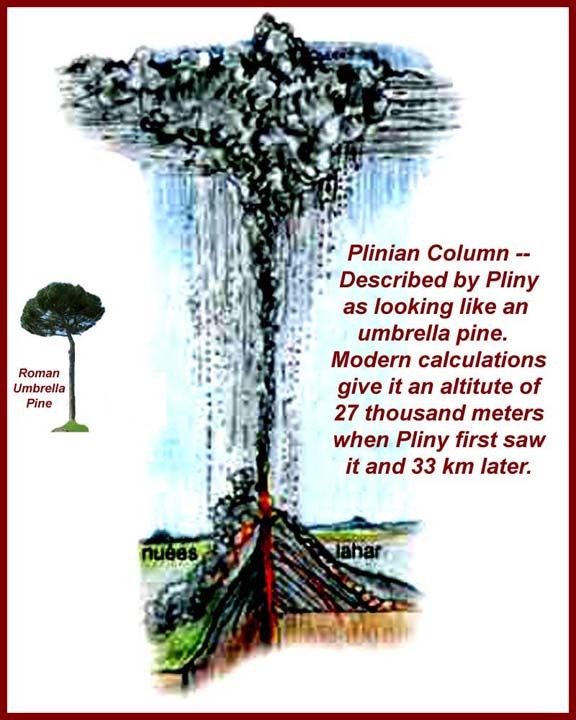 Typical "Plinian" eruption column -- shaped like an umbrella pine. Wind blew SSE that day (usually it is ENE) and blew the cloud directly over Pompeii. Tephra fell on Pompeii at 12 -- 15 cm/hour (5-6 inches/hour) -- mostly (90%) in the form of small pumice clasts. (Pumice is essentially foamy glass, clasts are chunks. Most of the clasts were less than an inch in diameter.) The other ten percent were "lithics", that is, heavier rocks up to 2 inches in diameter. During the first seven hours, 1.4 meters of white pumice fell on Pompeii. Many people fled, but some thought their homes would be safer than the hot and dusty outside air where rocks were falling like snow. Although the individual clasts were light, the accumulated weigh brought down many roofs. Then the Plinian eruption evolved. It tapped into a lower portion of the magma chamber where the melted rock was less evolved, and the ejected pumice turned gray. The change was abrupt, indicting a sharp interface between the two types of magma in the chamber. At the same time, the force of the eruption increased dramatically, lifting the ejecta column to 33 km. The rate of fallout on Pompeii decreased because the increase of force made the particles much smaller and they were carried farther away to the SSE before they descended. Another meter and in some places two of this gray pumice fell on Pompeii over the next 5 -- 6 hours gradually decreasing in the rate of fall. It must have seemed like the event was ending, and there is evidence that some folks went back -- either to retrieve valuables or to steal them. Footprints of military hobnail boots are found on the top of this layer, indicating that a rescue effort may have been under way. During the Plinian phase of the eruption, there was little effect outside the fallout zone to the south of the volcano. The Peleéan phase followed (named after the Mount Peleé eruption of May 1902 that killed 30,000 in Martinique). After about 12 hours of continuous Plinian activity, i.e. the sustained violent outrush of gas and magma, a change in the eruptive dynamics occurred that would be fatal to thousands of people around the volcano. Several factors probably contributed to the change: (A) the vent probably widened thus distributing the eruptive pressure over a wider area; (b) the mass eruption rate (the amount of molten stone coming out) increased and the weight of the Plinian column increased proportionately; and (c) the volatility (gas content) of the magma was being exhausted. The result was the collapse of the eruptive column. Terminology: These definitions are controversial within the volcanological community, so we have to define what we (or rather I, your humble servant) mean by them. Pyroclastic surges and flows are hot clouds of volcanic ejecta that come down the sides of mountains at high speeds. Gravity causes the heavier stuff to stay closer to the ground and pick up a lot of speed as it goes. During the descent, the lighter materials tend to get thrown up into the air as they come down the slope. This airborne fraction, often called the "pyroclastic flow" moves only slightly slower than the surge and arrives almost as hot. Because it is higher in the air, it is less susceptible to channeling by terrain features. Because they move more slowly and because they actually carry much more mass -- smaller particles, but tons more of them -- flows can leave behind massive thick deposits -- they left several meters in Pompeii and more than 20 meters in Herculaneum. The Plinian column can and, in this case, probably did pulse -- it partially collapses, and then, because it thereby loses mass, it then can again hang in the air for a while. The pulsing causes repeated linked pairs of surges and flows. The first pyroclastic surge hit the walls of Pompeii within a ten minutes of the start of the collapse of the Plinian column. It does not appear to have breached the wall. Seconds later its linked flow came over the wall. Still moving at more than 100 km per hour and with a temperature of several hundred degrees, it was immediately fatal to anyone it touched. Those sheltered in buildings would die almost instantly from breathing superheated air. (This is technically not suffocation, but most folks call it that anyway.) Whether caught up in a surge or a flow, death would be almost instantaneous. The first pyroclastic surge and flow pair struck Herculaneum within four minutes of the collapse of the column. Many folks had gone to the shoe hoping to escape by sea, but when they saw the flow coming -- a bright glowing cloud-like mass hurtling down the mountain -- those who could dove into the arched boat sheds cut like caves into the low shoreside cliffs. Hundreds actually made it into the sheds, but they still died almost instantly from breathing in superheated air that followed them inside as the surge/flow arrived. 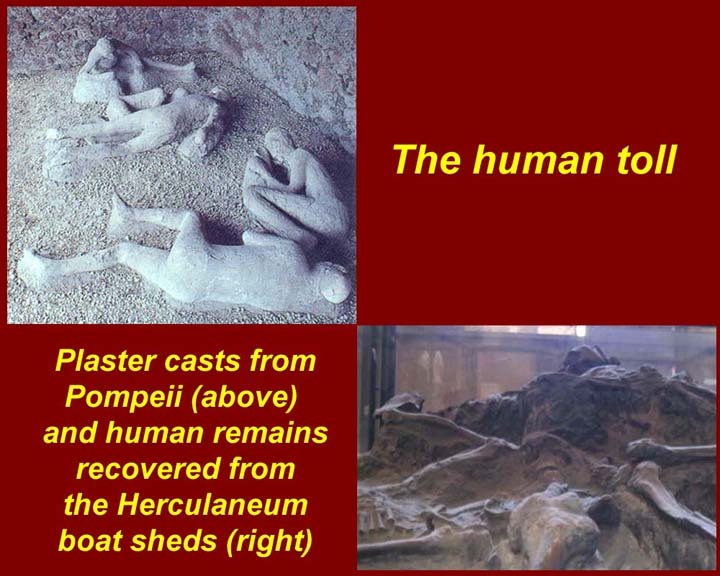 The folks in Herculaneum had watched the ash-fall envelope Pompeii, but they were wiped out by that first surge that actually hit them before it hit Pompeii. 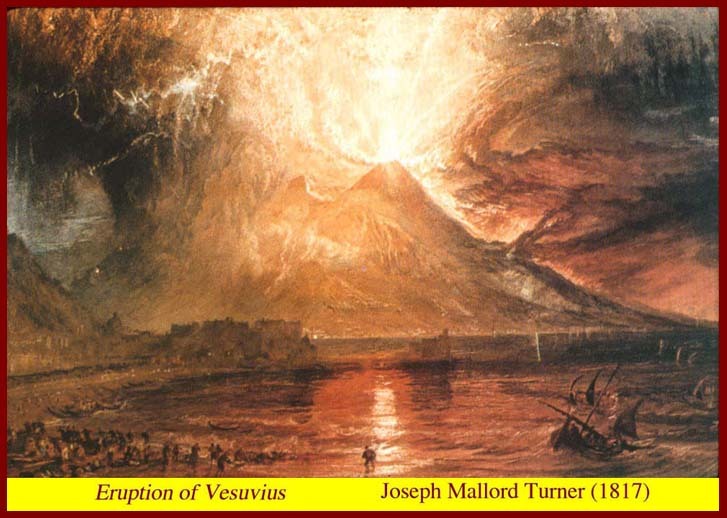 Herculaneum was then overwhelmed by lehars -- pyroclastic flows mixed with mud mixed from the melt-down of the small glacier that had previously been on Vesuviusí slopes and from rain that was wrung from the air by volcanic effects on the atmosphere. 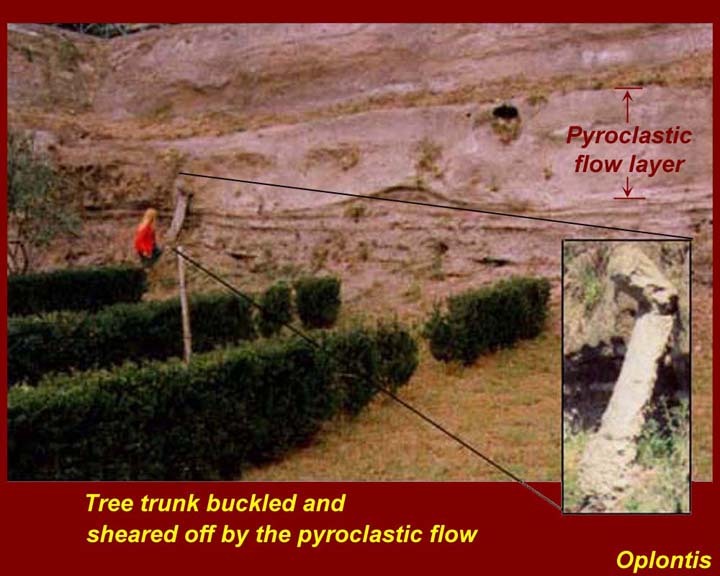 Nuées ardente and pyroclastic flows and ignimbrites. This is where the controversies arise, not because volcanologists can not agree on what happens, but because they insist on fighting over the names they apply to what happens. Because Martinique was French in 1902, the Peleé eruption was mostly observed and studied by Frenchmen. The French and some other volcanologists talk about nuées ardente, which are a subset of what some other volcanologists call pyroclastic flows. Nuée ardente means "glowing or fiery cloud". The nuées ardente crowd say that a nuée ardente is identical with a pyroclastic flow and, further, that a pyroclastic flow can only be caused by ejected materiel avalanching right down the slope (i.e., not the result of a collapsed Plinian column). They say that the result of a collapsing column is something different called an ignimbrite flow, which leaves behind deposits of fused or loose ignimbrites -- fused if the deposit was hot enough to partially melt and stick together and loose or "unfused" if not. Almost all volcanologists call what is left behind by any of these events the same thing -- ignimbrites. Ignimbrite deposits are often surrounded by fringes of other debris including blocks of pumice that are pushed outward by the fast moving flows. To further confuse the issue, some volcanologists call the surge the flow and vice-versa. About 3500 people are known to have died in the AD 79 eruption. That number represents the number of remains actually found. It is assumed that many people were also caught in the countryside and perished. Occasionally a few ore are found when a new archeological site or construction site is opened, and once in a while hundreds are found huddled together as was the case when the Herculaneum boat sheds were excavated a few years ago. It is unlikely that any accurate count will ever be possible. By carefully studying destruction paterns, modern volcanologists have determined that there were areas which were slightly cooler than others. Niether the "cooler" nor "hotter" areas would have allowed survival, however. Destruction was widespread at all known sites. Roofs and ceilings collapsed under the weight of the tephra. Walls that were perpendicular to the surges and flows were knocked down, and if they were strong enough to survive the blast they set up eddies that swirled around and inside. In Pompeii, many walls survived where there might already be two or three meters of tephra in place to support them. There are some clear examples of trees bent over or broken by the blast at precisely the level of the top of tephra falls. Organic materials were, in many cases, instantly carbonized by the extreme temperatures of the air in the surges and flows. Where this material was not completely blown away, it can still be seen in a carbonized state -- doors, furniture, grain, bread, and most importantly, the thousands of scrolls in the house that Julius Caesarís father-in-law had built more than a century before the eruption.